Bob Carlton flies his SubSonex micro jet just over the waters of Lake Dillon. When: Saturday, June 11 beginning at 10 a.m. The airshow is free and open to the public. 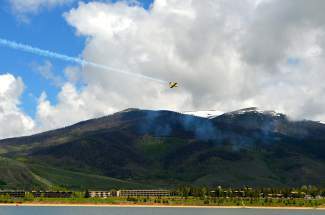 Pilots will fly at regular intervals from the start at 10 a.m. to the final performance around 12:30 p.m. Aircraft, boats and cars will be on display at the Marina until 2 p.m. Free music begins at noon at the Dillon Amphitheatre with a collection of local musicians, dubbed the Summit County All-Stars. For more info, see www.townofdillon.com. Finding pilots to pull hair-raising stunts at 10,000 feet is no easy task. Soaring through the air at top speeds, pulling multiple G’s while flying a hair’s breadth from another plane takes a special kind of talent. But the risk — and reward — are part of the charm of Dillon’s annual “Highest Air Show on Earth,” which features everything from WWII planes to custom jets. Evans, a former pilot, travels to air shows across the state. Every year, he brings a piece of his “air-show family” to Dillon for a lively morning of mock dogfights and breathtaking stunts. At this altitude, with thinner air and, therefore, less air pressure, pilots’ airspeed indicators work in a different manner. In addition, with less oxygen, engines have about half of the horsepower compared to sea level, Evans said. 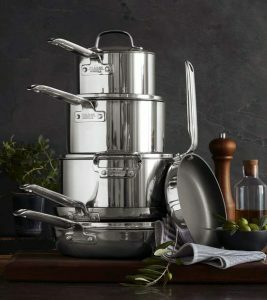 “There’s all this stuff that’s different,” he added. The free show will take place over the waters of the Dillon Reservoir this Saturday, June 11, with planes flying in from the Kremmling Airport starting at 10 a.m. This year’s show will bring in several familiar faces, including Summit County local Gary Rower with his 1942 Stearman biplane, Danny Sorenson and his home-built BF-109 biplane and Buck Roetman of Wild Horse Aviation with his Pitts biplane. Todd McLaughlin will fly his North American T-28 trainer and ground-support plane, JP Thibodau will fly the NA-50 WWII fighter and Bob Freeman will pilot the Extra 330 aerobatic monoplane. Don Nelson will also return in his Sukhoi, a Russian-built jet designed especially for aerobatic competitions. And, for a more modern take, retired rocket scientist Bob Carlton will return with his bright yellow SubSonex micro jet. Evans has arranged to bring in a few fresh faces as well, including Barry Hancock of Utah Warbird Adventures with his T-6, a WWII-era trainer. “He’s new this year — he puts on a pretty good show,” Evans said. When it came to this year’s final, however, Evans’ lips were sealed. “A special guest aircraft will close the show but for now, that’s classified,” he said. With the lake and surrounding mountains forming a natural amphitheater, good views of the show will be available all around. Evans recommended grabbing a spot at Marina Park, where a live announcer will broadcast information about the planes overhead, the maneuvers they are performing and their historical significance. Another good spot to watch the show is near the nature preserve, just across the water from Dillon. For those who want to watch the show from the lake, take note: Boats, kayaks and other watercraft may not be within 500 feet of the “box,” a large section of water marked by buoys which the planes will fly over. Since parking is limited, Dillon marketing and communications director Kirsten Anderson recommends visitors catch a bus from the Frisco Transfer Center, bike over or take free transportation from the parking lot at City Market. This year’s show will feature festivities on the ground as well, with a few displays set up at the Dillon Marina. The USAF X1 Supercar will be on display, as well as a Vietnam-era A-7 cockpit that will make for a perfect photo-op. Hudson Autosource will feature cars on display, and Sundance Marine will display their new boats, as well. In addition, the U.S. Air Force Academy Sailplane team will bring in their sailplane, and Colorado Northwestern Community College will have an aircraft and engines on display. 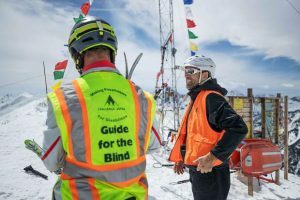 Summit County Search and Rescue and Kaiser Permanente will also be present, and a Kids Zone, food carts and more will be available that afternoon.